Istanbul is still the cultural and the financial capital of the country but not the official capital anymore. It has such a diverse and rich history, and has been the capital of tree great empires; the Roman, Byzantine and the Ottoman. 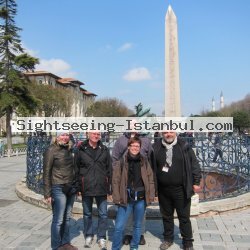 Visitors of Istanbul need many days to explore the city. •	Please don’t forget that ladies are required to wear scarves and decent clothing during mosque visits. •	See the remnants of the three great empires together on the same tour. •	Experience the religious, administrative and social aspects of history together. •	Learn about all these places from Yüksel Kivrak or his associates. •	No crowds, no queues! Authorized professional tour guides have priority ticket booths. This is not valid at the Blue Mosque. •	You can ask all the questions you like. •	In the Grand Bazaar, go to the backstreets and some specialty stores which you would not find by yourself easily. Additional information : The Topkapi Palace is closed on Tuesdays and will be replaced by the Turkish and Islamic Art Museum on Tuesdays. The Grand Bazaar is closed on Sundays, and the Spice Bazaar •	Learn about all these places from or professional tour guides.